“Without ghoulish make-up… she’ll freeze the blood of every motion picture fan…"
One year before BRIDE OF FRANKENSTEIN (1935), there was The Female Frankenstein of Fifth Avenue! That’s how Paramount Pictures pitched Mary Morris' character, "the vicious, venomous New York aristocrat" named Victoria Van Brett, as the sinister star of the 1934 chiller, DOUBLE DOOR. The story yanks the familiar Old Dark House setting away from its traditional windswept moors and plunks it down in turn-of-the-century Manhattan. 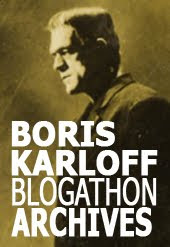 The banal title refers to a secret, airtight and soundproof room — the tale's murder weapon, as it were. "Mary Morris… a specialist of sinister roles begins where Frankenstein and Dracula left off… The deadliest menace the screen has yet known!" 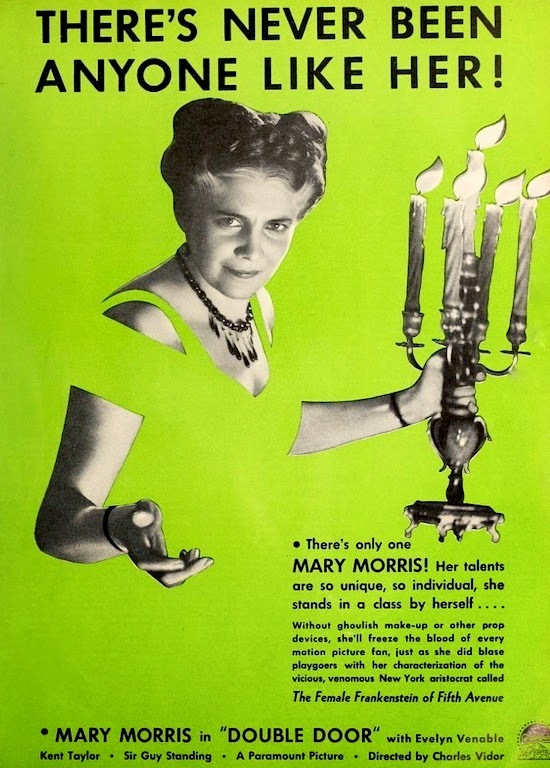 DOUBLE DOOR came to Hollywood via Broadway, with Morris reprising her showy role. The notices had been fairly good but the play ran only 143 performances in late 1933. Likewise, the film scored favorable reviews, followed by a very modest box office showing. 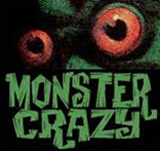 The New York Times called the film "a careful and intelligent copy of the original", building "an atmosphere of gloom, hysteria and malignant evil". Morris' Van Brett, variously described as a "grim and fish-eyed mistress", "a model of up-to-date witchcraft" and a "cruel old witch", stole the show. The NYT critic noted how a rowdy balcony crowd heckling the screen-bound villainess was ultimately silenced when, "with lighted candle and enigmatic smile", she lured the heroine into the mystery chamber. 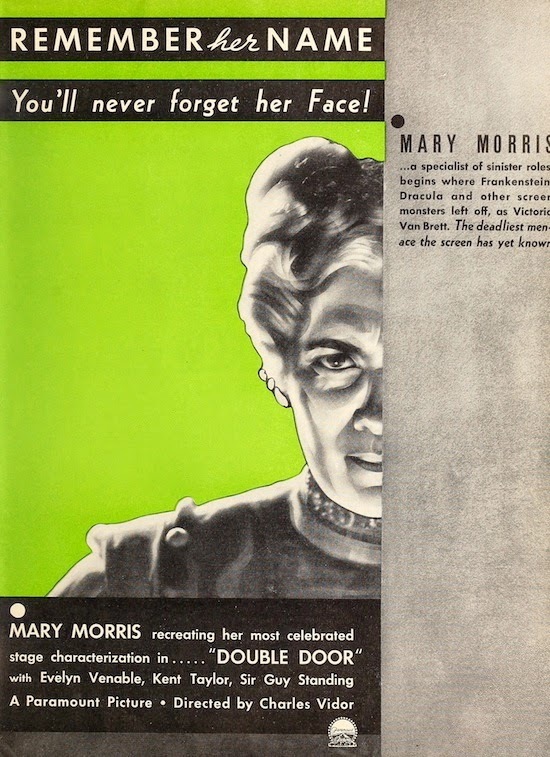 And so, briefly, in '34, Mary Morris was billed as The Female Frankenstein, the name used as shorthand for chills and monstrous evil. 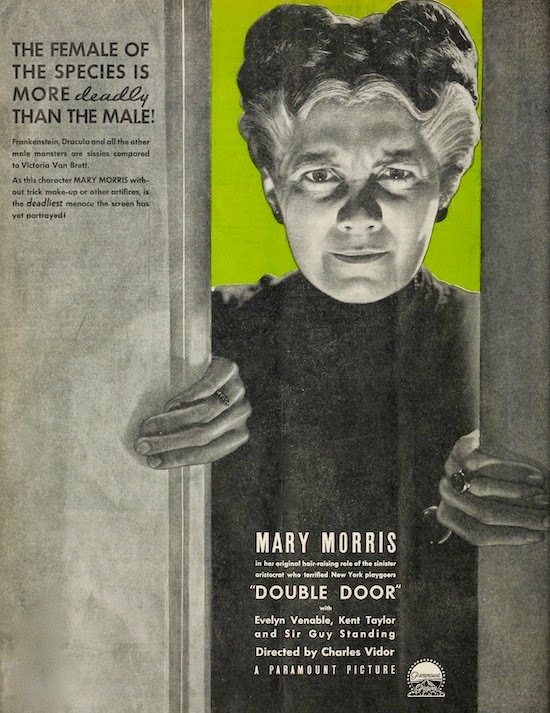 As it turned out, DOUBLE DOOR would be the formidable Mary Morris' first and only motion picture! Upon wrapping, she promptly returned to New York where she enjoyed a distinguished stage career that spanned a full forty years. A review of DOUBLE DOOR by David Cairns on Shadowplay. Interesting that the movie would be publicized in that way considering that these days there is justifiable doubt as to whether DOUBLE DOOR is really a horror film or not. At the time, there seemed to be little doubt. Mary Morris was probably wise to go back to Broadway. Her performance in the movie is fun but very very "stagey." More great stuff, Pierre, thanks.